If there is such a thing as a "Victorian style" these spoons probably come as close to that image as possible. Over the course of history, silver styles vary between intense decoration and plain surfaces. From the latter quarter of the 18th century (the Adam style) thru the Civil War period, output was quite plain. Fiddle pattern silver had very little ornament and only mild engraved initials or armorials. The great exhibition in London in the early 1850's exhibited a much greater degree of decoration in silver, but it took awhile until the idea became more popular. Shortly after the Civil War, tastes again began to change towards the more intense decoration. 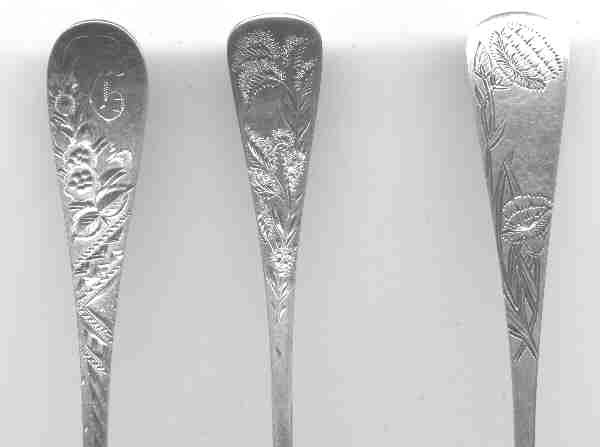 During the 1860 - 1895 time period, many pieces of silver flatware were given substantial engraved decoration. Most of these designs were patterned after flowers or other natural elements. During the first part of this era, it became a custom to turn the spoons face down when setting the table. Consequently, when guests were seated, they observed the back of the spoon. Manufacturers responded by creating detailed designs on the back bowl of many spoons. This set of spoons was made by the famous English firm of George Angell in 1874. He used his classic "beeded" design and further engraved the front and back with extensive detail. I have several extra pieces in this style if you would like to buy or trade. Exquisite engraving characterizes most Russian flatware of this era. 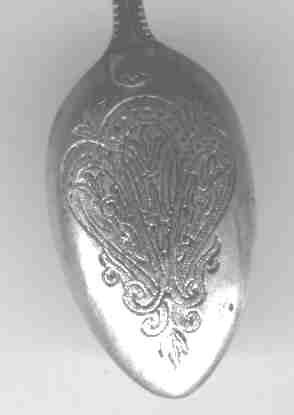 The picture shows the front and back of spoons which were created in 1884-1885. I have several of these pieces if you would like to purchase or trade. 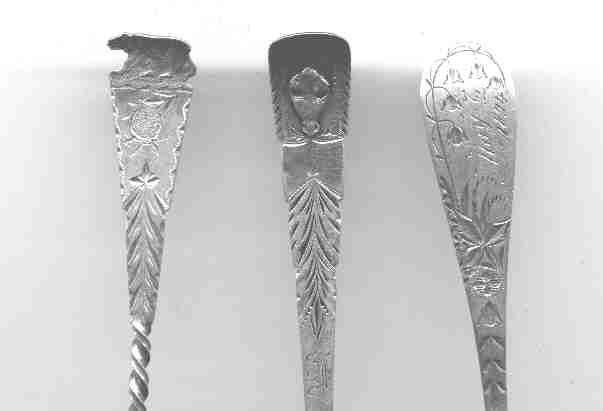 more examples of Russian Engraved spoons may be seen in the exhibits of Russian silver. By the early 1890's, the Americans were only decorating the spoons on the front of the handle. These are merely examples as there are numerous different patterns available from all of the major silver manufacturers. Of course these styles were often incorporated into souvenir spoons.